Once again, Google comes to our rescue. How did anyone get work done before Google? 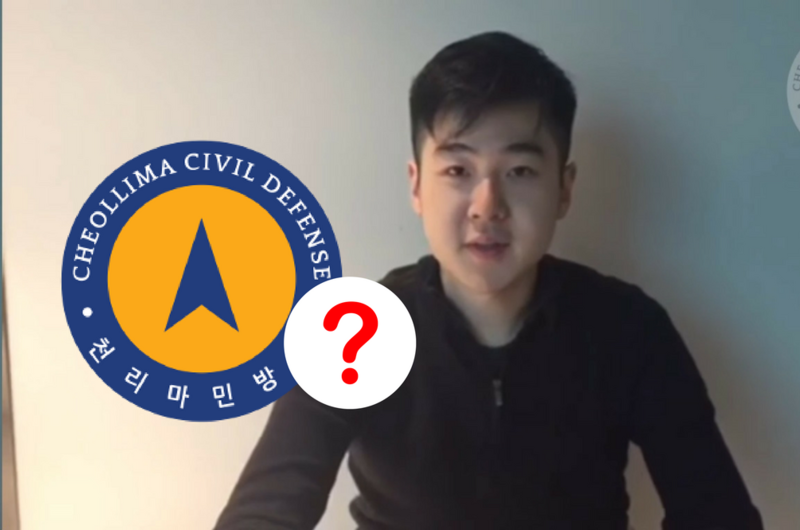 A video which allegedly shows Kim Jong-nam's son, Kim Han-sol, has surfaced online at a YouTube page called Cheollima Civil Defense. In it, the 21-year-old Han-sol holds up his passport to the camera and speaks in English. He addresses his father's murder and says he's currently safe with his mother and sister. He thanks the people who have rescued him and provided a safe-haven for him but those portions have been redacted. That said, who are the Cheollima Civil Defense? A quick look online brought us to www.cheollimacivildefense.org where we're greeted to a logo, lots of Korean text and some in English. This body of text is the first thing to greet you on the landing page. There are no links to any other page and the source code didn't reveal anymore information. We put the words into our Magic Translator 2000BS (Google Translate) and this is what we've found. "If you want to escape or want to share information, we will protect you. It can be in any country. We will send you safely to the place you want to go. We, who have already helped many North Koreans, do not want any money." After the break is a confessional signed by a "Senior North Korean Official". The essay below has been rewritten for clarity without modifying its original meaning. "When the people of North Korea come out from the country, the first word they will think about is "escape". Even the inspectors who check on ambassadors who are higher ranked than others – and sometimes – even foreign delegations think the same thing. If you live in the prison of life that is North Korea, you may share a common delusion that no senior citizen is a slave. Especially business travelers who come out of the country with their families, the summoning order to return home is as horrible as forcing them to their deaths." 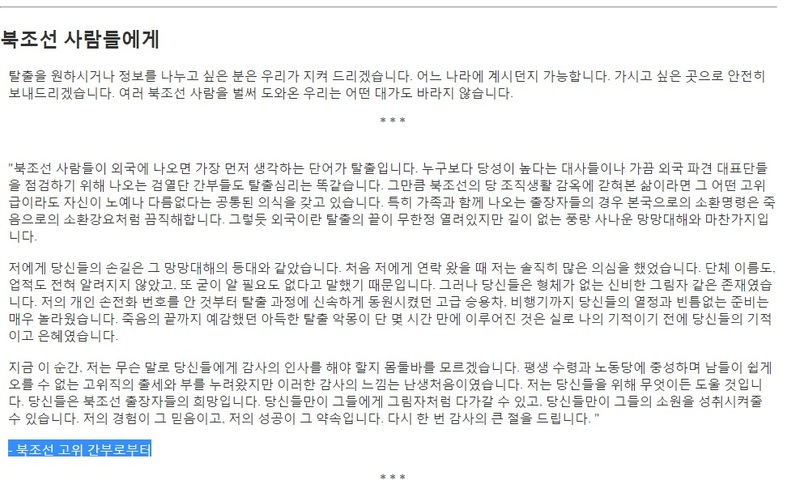 In the second and third paragraph, the writer goes on to thank the Cheollima Civil Defense. "To me, your hand that reached out to me was like the lighthouse in this oblivion. When you first contacted me, I honestly had many doubts. I did not know the name of the organization, the achievements at all, and I did not even need to know it. But you were a mysterious shadowless figure. Your enthusiasm and thorough preparation, to the luxury cars and airplanes that promptly mobilised and my personal handset number on the inside to the escape, the process was amazing. (The intent of the final line was that it was a miraculous escape)." "At this moment, I do not know how to say thank you to you. I have enjoyed a high level of success and wealth, loyal to my life and the Labor Party and unable to rise easily, but this feeling of gratitude was for the first time in my life. I will do anything for you. You are the hopes of North Korean businessmen. Only you can approach them like shadows, and only you can fulfill their wishes. My experience will give you faith, and my success is a promise. I will once again give you a big thank you." At least from the text, we can surmise that the Cheollima Civil Defense are a clandestine operation that extracts North Koreans who wish to defect. It is unclear why they have made their presence public for the first time and it is unclear if their claims are authentic. Perhaps it's a ploy by the North Koreans to identify defactors, maybe it's an authentic humanitarian effort. We don't know. RojakDaily.com has since emailed the address provided and are waiting for comments.